With that context, I reprint it here. In the second round of comments here, Brad Wilcox chose to focus on my argument that marriage promotion doesn’t work—that is, it doesn’t lead to more marriages. I have two brief responses to his comments. But Cohen did not do justice to the existing literature on the HMI [Healthy Marriage Initiative] or of interventions like those used within it. For instance, he ignores evidence of modest success for the Oklahoma Marriage Initiative in fostering family stability (the longest running local effort working on this issue) and research that found that spending on the HMI was “positively associated with small changes in the percentage of married adults in the population” (italics in the original). However, in my essay I linked to my book, Enduring Bonds: Inequality, Marriage, Parenting, and Everything Else That Makes Families Great and Terrible. There I dealt with the subject in much greater depth. [Hawkins, Amato, and Kinghorn] attempted to show that the marriage promotion money had beneficial effects at the population level. This is wrong. If funding levels were low and there was no effect in the early period, and then funding levels rose and effects emerged in the later period, then the analysis for all years should show that funding had an effect; that is the point of the analysis. This decision does not pass the smell test. Having determined that this decision would help them show that marriage promotion was good, they went on to report their beneficial effects, which were “significant” if you allowed them a 90 percent confidence (rather than the customary 95 percent, which is kosher under some house rules). However, then they admitted their effects were significant only with Washington, D.C., included. Our nonstate capital city is a handy wiggle-room device for researchers studying state-level patterns; you can justify including it because it’s a real place, or you can justify excluding it because it’s not really a state. It turns out that the District of Columbia had per capita marriage promotion funding levels about nine times the average. With an improving family well-being profile during the period under study, this single case (out of fifty-one) could have a large statistical effect on the overall pattern. Statistical outliers are like the levers you learned about in physics—the further they are from the average, the more they can move the pile. To deal with this extreme outlier, they first cut the independent variable in half for D.C., bringing it down to about 4.4 times the mean and a third higher than the next most-extreme state, Oklahoma (itself pretty extreme). That change alone cut the number of significant effects on their outcomes down from six to three. Really. These kinds of shenanigans give social scientists a bad name. (Everything that is nonsignificant is that way because of the [relative] size of the standard errors—that’s what nonsignificant means.) And what does “comparable in direction and magnitude” mean, exactly? This is the kind of statement one hopes the peer reviewers or editors would check closely. For example, with D.C. removed, the effect of marriage promotion on two-parent families fell 44 percent, and the effect on the poor/near-poor fell 78 percent. That’s “comparable” in the sense that they can be compared, but not in the sense that they are similar. Again, the authors helpfully explain that “the lack of significance can be explained by the larger standard errors.” That’s just another way of saying their model was ridiculously dependent on D.C. being in the sample and that removing it left them with nothing. In short, this paper provides no evidence that HMI funding increased marriage rates or family wellbeing. Of course, lots of programs fail. And, specifically, some studies have failed to show that kids whose parents were offered Head Start programs do better in the long run than those whose parents were not. But Head Start is offering a service to parents who want it, a service that most of them would buy on their own if it were not offered free. Head Start might fail at lifting children out of poverty while successfully providing a valuable, need-based service to low-income families. As you can imagine, I am all for giving free marriage counseling to poor people if they want it (along with lots of other free stuff, including healthcare and childcare). And if they like it and keep using it, I might define that program as a success. But it’s not an antipoverty program. Finally, in response to the idea that we just need more funding and more research to know if marriage promotion works, here’s my suggestion: in the studies testing marriage promotion programs, have a third group—in addition to the program and control group—who just get the cash equivalent to the cost of the service (a few thousand dollars). Then check to see how well the group getting the cash is doing compared with those getting the service. That’s the measure of whether this kind of policy is a success. This essay was originally published as part of a forum on the success sequence sponsored by the Cato Institute, featuring Michael Tanner, Isabel Sawhill, and Brad Wilcox. That idea of using public information campaigns to preach “marriage culture” echoed the futile proclamations of a previous generation. In a Hoover Institution symposium in 1996, former vice president Dan Quayle wrote that, “when it comes to strengthening families … we also desperately need help from nongovernment institutions like the media and the entertainment community.” Taking up the call with even more zeal, in 2001 Heritage Foundation fellow Patrick Fagan declared it was time to add three W’s to the common three R’s of schooling. “We need to stress something just as fundamental [as reading, writing, and arithmetic],” he wrote. “Call it the three W’s: work, wedlock and worship. … Put all three in the lives of parents and children, and they thrive.”* Five years later, another Heritage fellow said of the three W’s, “According to the social science data, if these three fundamentals are in place, government social policy is virtually unnecessary.” In 2012, the National Marriage Project, under director W. Bradford Wilcox, was again calling for “community-based and focused public service announcements” and a Hollywood “conversation” to promote marriage. Given the well-documented desire of most young adults to finish high school, get a job, and get married—if the opportunity to follow that course presents itself—there is no reason to think the people reached by the proposed campaigns would not either already plan to follow the sequence or rightly suspect that it is not feasible for them. The decision to delay childbearing in hopes of marrying first rests on assumptions about the future—education, economics, relationships, health, stability—that the target population simply cannot makeabout their own destinies in today’s economic and social context. Improve the basic equation, the material expectations of young adults, and you won’t need a campaign to change behavior. * Thanks to Shawn Fremstad for this nugget. recognize social scientists and other leaders in the public arena who champion the use of informed judgment to advance the public good. The Moynihan Prize is intended to honor those who, like the late Senator, have promoted the use of sound analysis and social science research in policy-making, while contributing to the civility of public discourse and pursuing a bipartisan approach to society’s most pressing problems. This year’s winners are Ron Haskins and Isabel Sawhill, longtime fellows at the Brookings Institution, specializing in poverty policy. Now that classes are over I’m going to head downtown to hear their speeches. Four-out-of-five myths about America: During the economic crisis, Haskins and Sawhill say giving poor families more money is a mistake. Blame the poor, “We tried generosity and it just doesn’t work” edition: I accuse Haskins of spreading the “stupid and evil” meme that all the money we’ve spent on poor people didn’t “work” because we still have poverty. A few ways Isabel Sawhill is wrong on single mothers: I argue that Sawhill misrepresents the research record as she reflects on the 50th anniversary of the Moynihan Report. No, poverty is not a mysterious, unknowable, negative-spiral loop: I criticize Haskins (and the “consensus plan” to address poverty) for ignoring the obvious implications of the history of Social Security: when you give people money, they’re not poor anymore. Delayed parenting and anti-poverty policy: While supporting greater access to reproductive healthcare, I raise doubts about the policy of deterring early births as an anti-poverty strategy. Here’s a preview of talk today at Brown University’s population center. My basic argument is that policies intended to prevent poverty by delaying parenthood are mostly misplaced, especially with regard to Black women. Not that delaying parenthood is bad per se, but delaying parenthood in the absence of other improvements in people’s conditions is ineffectual in the aggregate, and actually harmful for some populations. It would be better for couples, for children, and for society if prospective parents plan their births and have children only when they are financially stable, are in a committed relationship (preferably marriage), and can provide a stable environment for their child. It is only fair to expect parents to limit the number of children they have to something they can afford. Adjusted Probability of Infant Death, by Maternal Age: White, Black, and Mexican Mothers, U.S., 2013. Predicted probabilities of infant death generated by Stata margins command, adjusted for plurality, birth order, maternal education, prenatal care, payment source, and cigarette smoking during pregnancy. Data source: 2013 Period Linked Birth/Infant Death Public Use File, Centers for Disease Control. Of course, infant mortality is thankfully very rare, but it’s the extreme measure for the underlying pattern of women’s health. When infant mortality in a group is higher, their average health is usually worse. I’m adding to that the following descriptive figures on children’s poverty rates according to how old their mothers were when they were born. This is by necessity limited to children who are still living with their mothers, because I used the Current Population Survey. 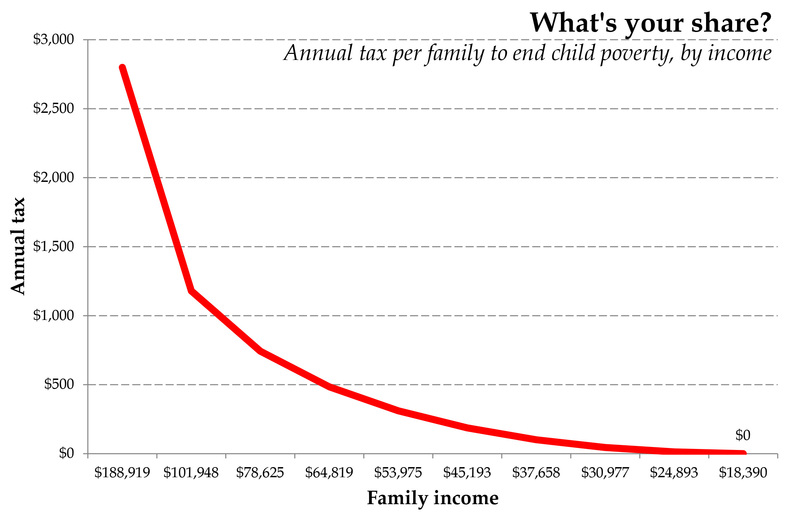 I show this for all children (black lines), and then for those whose mothers have never married (red lines). The solid lines are official poverty-line rates, and the dotted lines use the Supplemental Poverty Measure. The latter shows lower poverty rates for children whose mothers were younger, because it reflects transfer income and welfare support as well as income from unmarried cohabiting partners. For children overall (black lines), being born to an older mother appears beneficial in terms of poverty rates. This fits the standard story, in which delaying births allows women to go further in school and their careers, and get married, as well as being more mature and so on. However, for those whose mothers remain unmarried the relationship is much weaker, and there is no relationship to the SPM. To me this undermines the policy of delay with regard to women who have low probability of marriage during their child-bearing years. Which brings me back to Black women. For White women there is a strong relationship, with lowest poverty rates for children whose mothers were in their 30s when they were born. For Black and Hispanic women the relationship is much weaker (it actually looks very similar when you control for education as well, and if you use the continuous income-to-needs ration instead of the poverty-line cutoff). My conclusion is that I’m all for policies that make family planning available, and U.S. women should have better access to IUDs in particular (which are much more common in other rich countries) — these need to be part of better medical care for poor people in general. But I don’t favor this as a poverty-reduction strategy, and I reject the “responsibility” frame for anti-poverty policy evident in the quotes above. I prefer education, jobs, and income support (which Sawhill also supports, to her credit). See Matt Bruenig on the Brookings “Success Sequence” and my op-ed on income support. For lots of their births, poor women were not ready, or not planning to get pregnant. But it’s also common for poor people to never achieve their ideal conditions for having children — good job, marriage, housing, education, and so on. In that case, with the clock running on their (and their mothers’) health, unintended childbearing is more complicated than just a behavior problem to be solved. It may reflect a compromise between unachievable goals. In addition to making sure everyone has the reproductive healthcare they need (including more effective contraception), I think we should also help people achieve their long-term ideals — including having the children they want to have — rather than (just) help them realize their short-term intentions. How about we stop moralizing and end child poverty tomorrow? How much would you pay to stop having to listen to rich people tell poor people how to run their families? If my calculations are correct, we can end child poverty for $62 billion per year. Is that a lot? No, it’s not. It’s $578 per non-poor family — but (if Twitter analytics are to be believed) my typical reader will pay less because I’ll put it on a sliding scale for you. Details below. In our system, the vast majority of poor people are those in hard-to-employ categories. As Matt Bruenig recently wrote, 83% percent of poor people are either children, old people, people with disabilities, students, people taking care of family members, or people who can’t find jobs. (Among the employed poor, most are sharing their income with family members who can’t work.) We are a “country that relies heavily on the market to distribute the national income,” Bruenig writes. But it’s actually the market via the family. If these vulnerable groups are people who need someone else’s labor to support them, at least temporarily, then the attitude written into our policies is that such support should come from their families. If your family can’t do it — or you don’t have a family — good luck. It doesn’t have to be this way. Children brought into the world before their parents were financially or emotionally ready for them are … disadvantaged before they’re even born, no matter how loved they are. That “financially or emotionally ready” line is from Sawhill, and its implication is clear, though its advocates are for some reason squeamish about saying it plainly: poor people should not have children. I hate this attitude. Look: children usually (fortunately) don’t make money. Somehow income from someone else’s labor has to pay for their homes, schools, doctors, food and water. A lot of that money comes from the state (for rich and poor kids alike). But under our stingy welfare state, if their parents don’t have decent jobs they wind up poor. The mindset that sees our welfare system as a fixed entity looks at this and says, “These kids are poor because of their parents. They weren’t financially ready to have kids.” Wrong. They’re poor because we insist on it. I would like to live in a society — in a neighborhood, a community — in which people without good jobs can still have children, while they’re young, and have happy families. And I’m willing to pay my share of the cost of that. Are you? It’s not as much as you think. All I did was calculate how much below the poverty line all the poor families with children are. That is the amount we need to raise (each year) to end child poverty. Then I distributed that cost across the non-poor families, on a sliding scale. How hard would this program be? We already have all the infrastructure in place to move income around; it’s just a change in the tax code. Where are we going to get that kind of money? From non-poor families. The tax is only applied on the surplus for each family — that is, the resources they have (after taxes, work expenses, health care and child care) over their poverty threshold. 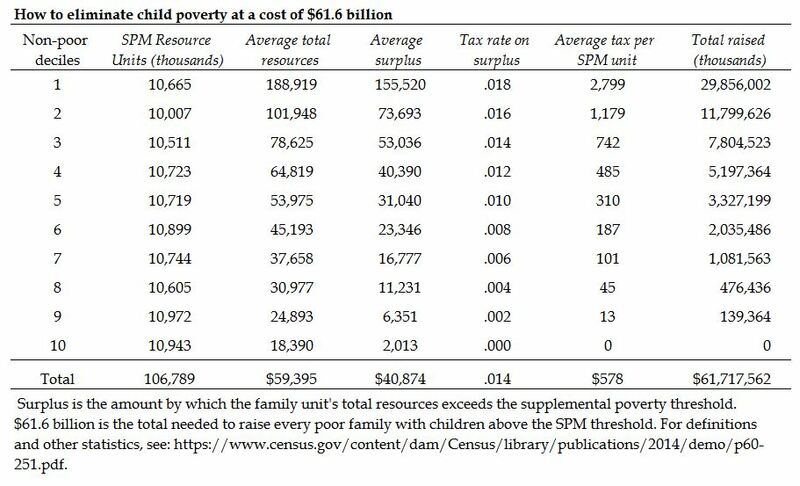 If we tax the surpluses of the richest 10% of non-poor families at the virtually painless rate of just 1.8% — and everyone below them at an even lower rate — we end child poverty in the U.S. Some people say the Pope should stick to religious matters, and not speak about politics. Some people also say a social scientist should stick to scientific analysis, and not make moral demands. You can ignore my moralizing, as long as you understand the fact that child poverty is a choice we make with our policies. Eliminating child poverty does not require restructuring American families, mass contraception campaigns, or a new ethos of shame. It just costs a little money. * Technical note: To do the calculations, instead of the official poverty rate I used the Supplemental Poverty Measure. This measures resources versus needs for “resource units,” which are either families (including cohabitors, foster children, and other people that are normally considered “non-relatives”) or unrelated individuals. For every resource unit, the poverty threshold is based on the cost of food, clothing, shelter, and utilities, adjusted for geographic location, housing type, and family composition. In addition to money income, the resources for the calculation include non-cash assistance like food stamps, school lunch, housing and energy subsidies; and then they deduct from resources taxes, work expenses, child care expenses, medical expenses, and child support (it’s all described here). I call resource units “families,” although some of them are single people. The Stata code I used to analyze the data, which includes the variables you need from IPUMS, is here. ** Please consider making a contribution of at least twice this to help address the much larger problem of poverty in the poor countries of the world. This expands on some practice-what-you-preach criticism of conservative marriage promotion, with some numbers. I’m not endorsing the approach described here — I’m saying marriage promoters should adopt this if they are serious about promoting marriage to reduce poverty. In response, Sandy Darity tweeted: “I proposed that a marriage antipoverty strategy should have rich white men marry poor black women.” I don’t want to put the onus for ending poverty just on pro-marriage pundits. Instead — as Darity suggests — we should think in terms of broader policy. [William Julius] Wilson argued that declining professional prospects made some black men less marriageable. Patterson thinks that declining marriage rates had more to do with the increased availability of contraception and abortion, which eroded cultural norms that had once compelled men to marry the women they impregnated. Whether the proximate cause is men’s reduced economic prospects or changing norms, the fact is that if poor people changed their attitudes (norms, culture) about marriage — if they put more priority on the importance of marriage and worried less about the economic qualities of the match — there would be more marriage and, they say they believe, less poverty, inequality, violence, and abuse). An obvious problem with this whole enterprise is that the marriage boosters assume the next marriage they generate through marriage promotion will be as economically beneficial to the participants as the average existing marriage observed in the population. But if one of the reasons for non-marriage is poor economic status, then it follows that the next marriage generated will on average be much less beneficial economically than the average marriage (I expanded on this here). So the plan to reduce poverty by promoting marriage among the poor is running uphill. Or, it would be running uphill if it was running at all, but of course (ridiculous research shenanigans notwithstanding) their billion dollars spent has yet to generate a marriage, so this is really all very generous speculation. For several decades, marriage promoters have been complaining that “the culture” isn’t pro-marriage enough. The latest version of this, from David Blankenhorn and colleagues, seeks to “restore a marriage culture among the less privileged.” But, although it’s true that poor people (especially poor Black people) have seen a faster drop in marriage rates, that’s not where the biggest anti-poverty gains are to be had. If you really want marriage to reduce poverty, and you really think policy can change “the culture” to make more marriages, then what you really need is (as Darity said) some rich (mostly) White men to marry some poor (disproportionately) Black women. Why not? Is it really more far-fetched to imagine you could change rich White men’s attitudes toward poor Black women than it is to suppose you could “restore a marriage culture” among the poor? Why? Maybe one reason policies to increase marriage among the poor haven’t work is because the economic benefits aren’t great enough. If you were the kind of person that goes in for this sort of policy (which, again I am not), you’d have to assume poor people would be more receptive to the idea of marrying rich people — that’s one important premise of Wilson and Patterson’s perspective. So the problem is rich people don’t want to marry them. How difficult can this be? Just to put some numbers to the idea, I did the following simple exercise. 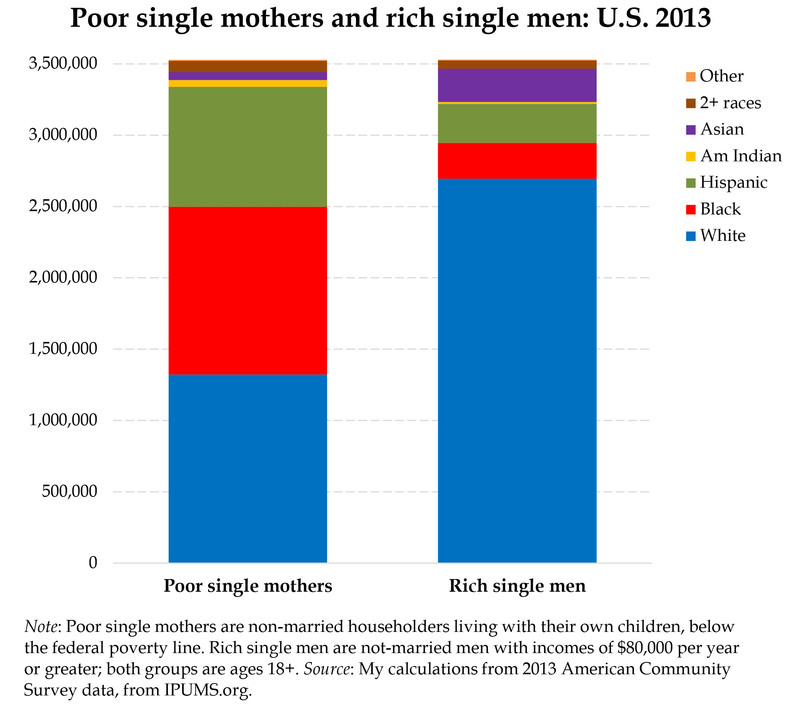 Take all the poor single mothers — specifically, non-married women living in their own households with their own children, with family incomes that put them below the federal poverty line — and match them up with rich single men. If the problem is that poor women are too economically choosy to marry the poor men in their lives, then we could easily lift these 3.5 million single mothers — and the 7.1 million children in their families — out of poverty simply by changing the anti-marriage views of these selfish, rich, single men. Of course, we’d have to reduce racist attitudes also, but not entirely — only a third of the non-Black rich single men would need to open their minds to the possibility of marrying a Black woman. You would have to be creative with the incentives for these men, including consciousness-raising and parenting classes, as well as, for example, Starbucks gift cards and subscriptions to the Economist. Now, no one thinks you can socially engineer — through shame or tax incentives — the marital behavior of entire populations, so this strategy couldn’t be expected to completely eliminate the problem of single mothers and their children living in poverty. But it couldn’t be less effective than the marriage promoters have achieved with the last billion dollars they spent.